Discover software that can automate your product innovation processes. Our Certified Software Directory shortlists solutions that have successfully achieved Stage-Gate® Ready status. Certified software must achieve all mandatory criteria to achieve category certification. Ask vendors to supply their Stage-Gate Ready Report to see the details of the optional criteria they have achieved. Accelerate new product time to market. Increase the number of new products that achieve their revenue and profit targets. Increase return on NPD investment. Provide real-time visibility of status & performance, improving decision making and execution results. Achieving innovation, digital transformation, and growth strategies requires planning and managing business outcomes, not just projects. Outcomes take many forms, including products and services for customers, as well as enabling technologies, applications, and data. With Planview’s Product Portfolio Management solutions, organizations can define every outcome that drives their business and manages the delivery of those outcomes with roadmaps that connect directly to the associated work and resources. 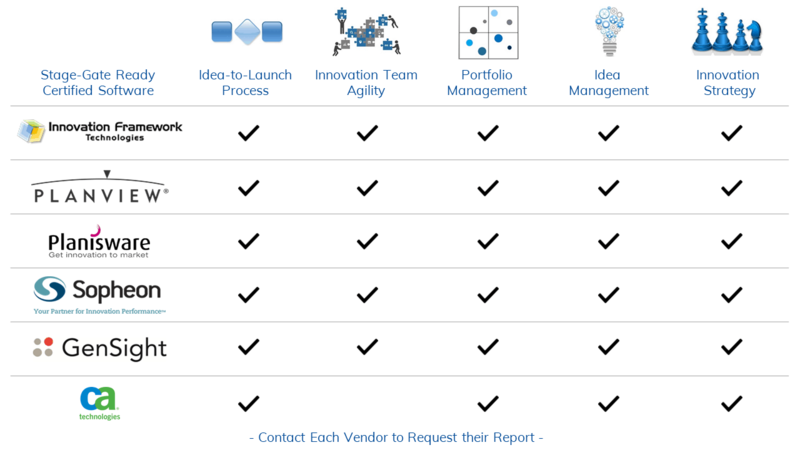 Planview’s solution for continuous product innovation enables organizations to better align their product portfolios to their innovation strategy by streamlining the prioritization and planning process – simplifying analysis of products and projects against criteria such as technical viability, financial impact, resource capacity, complexity, risk, and commercialization success to increase portfolio value. Our continuous product innovation solution automates the entire product innovation lifecycle – from concept to end-of-life – to help organizations increase revenue by selecting winning product ideas, reduce time to market, and improve portfolio transparency to mitigate risk. In addition, out of the box portfolio dashboards provide an interactive, multi-dimensional perspective into portfolio management scenarios supporting strategic planning, new product development, and portfolio performance. Capture ideas, prioritize products, visualize roadmaps, optimize resource capacity, manage the gated commercialization process, monitor product performance, and accomplish sustaining engineering initiatives. Planisware delivers software solutions that enable companies to more effectively manage their New Product Development, Research & Development, Engineering, and/or Information Technology. From the start, Planisware has always been focused on supporting complex R&D business processes; our solution is not just an adjusted IT solution. Portfolio visibility and “what-if” analysis In Planisware, users can assess and compare new and existing projects within the context of corporate strategies, assuring that projects with a high return and high probability of success receive the bulk of the funding and resources available. Process improvements Planisware reduces an organization’s time to market by coordinating all tactical and strategic activities within the company, while providing all stakeholders with the information needed to effectively perform their duties. Agile team collaboration Planisware ensures that project information is shared across the organization via collaborative tools that allows each stakeholder to share documentations and deliverables. Planisware has a track record of success with medium and large organizations with a 99% retention rate of satisfied customers. Over 300,000 users in more than 250 companies worldwide, including a 33% of the 100 largest R&D organizations worldwide, are relying on Planisware to manage their projects, products, programs, resources, finances, and/or portfolios. Planisware’s North American headquarters are located in San Francisco, California, and the company has offices across the US, Europe, and Asia. Sopheon customers use our enterprise innovation management software and services to align and connect their organization, drive best-practice innovation processes, and enable fast, iterative decision-making in the face of increased pressures from ever-evolving markets. While new product development is a core area of Sopheon domain expertise, enterprise innovation management goes beyond new ideas and new products and encompasses the innovation of the enterprise – managing all the investments a company makes to grow, win market share, and create more value. Sopheon’s Accolade® solution provides unique, fully-integrated coverage for the entire innovation management and new product development lifecycle. For the first time, businesses can access a single source of the truth across strategic innovation planning, roadmapping, idea and concept development, process and project management, and portfolio and in-market management. GenSight is a world leader in providing web-based solutions that enhance the innovation process in large and mid-sized enterprises. Focusing on the end to end process of getting new products to market, the GenSight solution enables Strategic Management, Idea Management, R&D, Product Development, Portfolio Management and Resources Management. The GenSight product suite is an integrated solution that covers the entire process, top to bottom, end to end. As an integrated solution, it means that cross-functional working is dramatically enhanced. In business for over 20 years, GenSight has always focused on the same goal – to provide leading corporations with best-in-class software solutions, that improve the new product process. GenSight provides a full-service solution – and the software functionality is tailored to their client’s specific needs. GenSight offer their solution via the cloud or installed on their client’s own servers, at the client’s choice. Recognized as an industry leader by both Gartner Research and Forrester, GenSight has deployed their solution to such leading organizations as AkzoNobel, Coca-Cola, GlaxoSmithKline, Johnson and Johnson, Pfizer, Suncor Energy and the US Department of Energy. CA Technologies (NASDAQ: CA) provides IT management solutions that help customers manage and secure complex IT environments to support agile business services. Organizations leverage CA Technologies software and SaaS solutions to accelerate innovation, transform infrastructure and secure data and identities, from the data center to the cloud. By providing solutions designed for how organizations work today, we leverage over 30 years of experience to drive our best practices that ease your deployment, speed your time to value, and reduce your risks. With industry-leading global support, world-class user education, and built-in training tools, you can cut your training time in half, reduce the burden on your support staff, and increase user adoption.